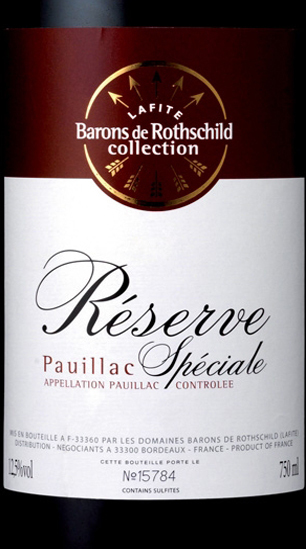 The Pauillac Rouge Réserve Spéciale of Domaines Barons de Rothschild as well as all the "Réserve Spéciale" of the maison, is obtained from grapes harvested in the best vineyards. The 70% Cabernet Sauvignon assembly, 30% Merlot allows maximum balance in deep respect for traditions. A great class red and very good quality. THE WINE The Pauillac Rouge "Réserve Spéciale " of Domaines Barons de Rothschild as well as all the "Réserve Spéciale" of the maison, is obtained from grapes harvested in the best vineyards. The 70% Cabernet Sauvignon assembly, 30% Merlot allows maximum balance in deep respect for traditions. A great class red and very good quality. THE COMPANY Owner of Château Lafite Rothschild for five generations, the Rothschild family has been associated with the vineyards of Bordeaux since 1868 and today owns Châteaux Lafite Rothschild, Duhart Milon, L’Evangile and Rieussec. In addition to the wines produced from their prestigious vineyards, the Barons de Rothschild have for many years created a range of more accessible wines for everyday drinking. Initially created at the request of family and friends, these were known as the “Réserves des Barons”. In a continuation of this tradition, Domaines Barons de Rothschild (Lafite) decided to produce the Réserves in four major Bordeaux appellations:: Bordeaux, Bordeaux Blanc, Médoc and Pauillac. In creating the Collection, DBR (Lafite)’s objective is to offer classic Bordeaux wines with immediate charm. Before 47,50 € tax incl. Tasting Color: ruby red and brilliant. Bouquet: persistent and very broad, spicy flavors of tobacco, cigar, pepper and nutmeg. Taste: full and robust, velvety tannins, fresh and spicy finish. The Pauillac Rouge "Réserve Spéciale" of Domaines Barons de Rothschild as well as all the "Réserve Spéciale" of the maison, is obtained from grapes harvested in the best vineyards. The 70% Cabernet Sauvignon assembly, 30% Merlot allows maximum balance in deep respect for traditions. A great class red and very good quality. Owner of Château Lafite Rothschild for five generations, the Rothschild family has been associated with the vineyards of Bordeaux since 1868 and today owns Châteaux Lafite Rothschild, Duhart Milon, L’Evangile and Rieussec. In addition to the wines produced from their prestigious vineyards, the Barons de Rothschild have for many years created a range of more accessible wines for everyday drinking. Initially created at the request of family and friends, these were known as the “Réserves des Barons”. In a continuation of this tradition, Domaines Barons de Rothschild (Lafite) decided to produce the Réserves in four major Bordeaux appellations:: Bordeaux, Bordeaux Blanc, Médoc and Pauillac. In creating the Collection, DBR (Lafite)’s objective is to offer classic Bordeaux wines with immediate charm.